Hardrick followed up a solid 2017 season with another stellar campaign in 2018. He missed three games due to injury, but for the other 15 — all starts — was a dominant presence at the right-tackle position along an offensive line that helped the Bombers finish first in scoring and Andrew Harris capture his second-straight CFL rushing title. Signed a one-year contract extension on November 28, 2019. Made 18 starts at right tackle as part of a steady offensive line that was critical in winning the rushing title and finishing second in scoring. His consistent play earned him a spot on the West Division All-Star Team and he was rewarded with a new contract after the 2017 season. Signed as a free agent and started 16 games in his first season with the club. Played a critical role in the team’s turnaround in 2016 and was part of a unit that dramatically cut down the quarterback sacks allowed. Made his CFL debut in 2014, dressing for 12 games and starting 10. 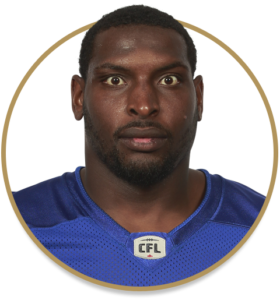 Made his first CFL start against the Bombers on July 25, 2014. Joined the Roughriders in 2015 and dressed for eight games, all starts. Made his first start for the Riders against the Bombers on Labour Day, 2015. Played at Fort Scott Community College before transferring to Nebraska where he became a regular starter at tackle. Spent two seasons with the Cornhuskers and went undrafted in the NFL in 2013. Had tryouts with Tampa Bay and New Orleans along with a stint in the Arena Football League with the Arizona Blaze.